Here’s the link to the photo. The gold-colored pendant would've been acquired about 17 years ago (so in the mid-1990’s) on a trip to Israel that the woman took to a grandson’s bar-mitzvah. ...but just in case, I told my friend I would run it by you guys. Any ideas? Ever seen something like it? It says Shalom, which is Peace. 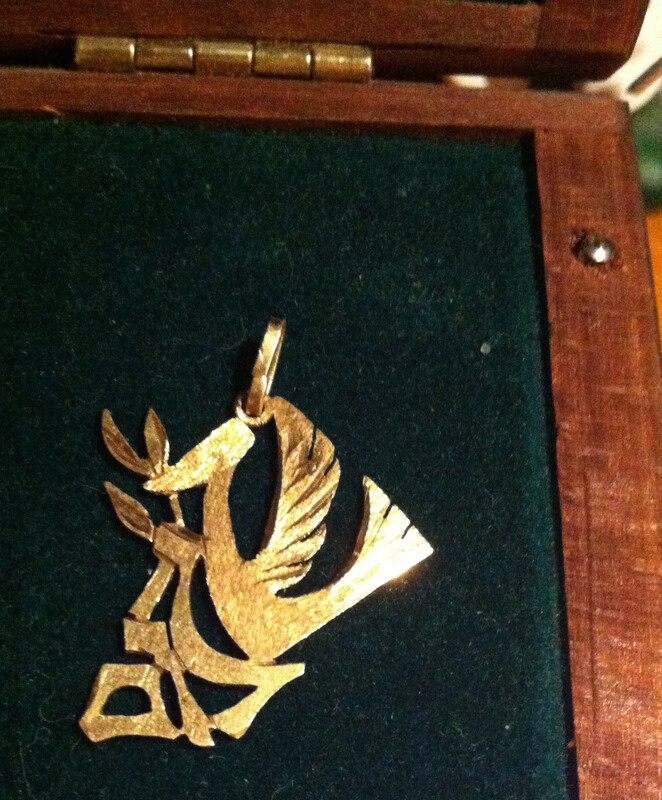 It's a dove with an olive branch, it looks like it says "shalom" (peace), where the dove is the shin (the first letter). The dove with the olive branch is from the flood story -- the dove brought the olive branch back to Noah to show that the flood was over. The dove brought the olive branch to show the flood was over; thus the dove and the olive branch as symbols of peace (i.e. of a world starting over free of the evil that had been washed away in the flood.) Four letters spell out the word "shalom" and the dove's body is also the first letter of the word.